[T430s] Is the key just broken? I've just bought a original backlit keyboard (azerty) for my t430s. The problem is the "G" key doesn't work (everything else is working well). 1/ I'm planning to buy a new "G" key, but first, I would like to know if there is a way to check what's wrong with the key, and if a new key will be the right answer to my problem? 2/ I found some websites that sell keys, do you know what's the best? Unfortunally, I don't find the same hinge/model than mine, there is always a small difference, so I'm not sure about that (I link a pic). Do someone have ever meet this issue? Re: [T430s] Is the key just broken? 1) Is it just that the key cap will not stay on? 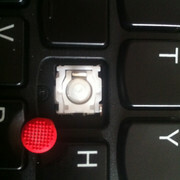 2) Or is it that the laptop does not detect any presses on the 'G' key even if you press the rubber dome directly? Excuse me for the wrong spelling. This suggests that it is some kind of problem with the keyboard matrix. Unfortunately a single key cannot be replaced, only the entire keyboard. 1) to rule out a software issue - can you check in BIOS / different OS? I was just going to give an edit to my post, because i've check a second time, and the 'G' key works when I push really hard the rubber dome. Does it change something about your last post? I'm running mint 18.2 but I won't be able to test another OS before weeks. I can try disassembling the keyboard and I have my old querty keyboard (that is not backlit), so maybe I can switch a piece..? Be very careful as the conductive traces on a laptop keyboard are easy to break. Good news, the seller has just sent to me a new keyboard! By the way, I still have the broken one. I love to repair stuff and things, so, do someone knows what is the process to follow in order to try repairing the key? If I fail ok no prob, but I would like to try eheh. They have excellent documentation and send you instructions if you buy a key from them. Whenever I need a key, I go to them. I will try it next month and post update in any case!